It’s the third time in the past year that UWA staff and students have uncovered spearheads on the island. Earlier this year a Heritage Studies student found a glass spearhead, and last year a staff member unearthed a ceramic one. The spearheads are believed to have been used by Indigenous men and boys who were imprisoned on island between 1838 and 1931. Records show photographs of Sunday hunting day when the Indigenous prisoners would hunt to supplement their diet of barley, cabbage and porridge with fish, snake and quokka. It is believed the prisoners would find a place on top of a hill often overlooking the mainland where they would make spear tips from scrap pieces of glass. Professor Len Collard from UWA’s School of Indigenous Studies said the most recent discovery occurred when the 45 students and eight staff from the UWA School of Indigenous Studies were learning about the history of Indigenous prisoners on the island. 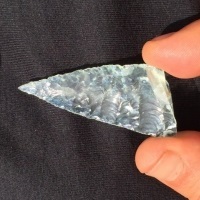 “As I was digging around in the sand with my foot, something shiny glinted in the light and I recognised the object to be a glass spearhead,” Professor Collard said. The group gathered around, keen to photograph the rare spearhead which is estimated to be at least 100 years old. “I can’t say why these finds are happening,’ Professor Collard said. The spearhead was re-buried at Rottnest to respect the Aboriginal tradition of keeping artefacts found in their resting place. “The story goes that if you take Indigenous artefacts off the island the old people will follow them,” Professor Collard said.